I have just bought and read “What Did The Baby Boomers Ever Do For Us?” (subtitle “Why the Children of the Sixties Lived the Dream and Failed the Future”) by Francis Beckett. I’ve reviewed it at Amazon.co.uk, giving the book 1-star, the minimum. Here is that review plus 2 diagrams and Further reading. The author makes it clear from the start that the baby boom he is discussing is not what others talk about, and that his sources are very narrow and unrepresentative. This book says much more about the author than about baby boomers as a whole. The author states that this book is about people born from 1945 to 1955. There isn’t a good demographic reason for this. In the UK there was a spike in births between 1945 and 1950, then a longer boom from about 1955 to 1973 peaking at 1964. But in the period between 1950 and 1955 the birth rate was pretty constant with no justification for extending the definition of the first baby boom beyond 1950. The author’s own circumstances are illustrated by “I was one of the blessed: born in 1945…. I went to a new state grammar school at the age of eleven, and to a new university in the sixties”. Only 25% went to grammar schools. Only 5% went to university (unlike about 35% nowadays). He did not share the experience of the other 95% of people born in the decade or two after the war. He “tells the story partly through lives of individuals”, including Tony Blair, Gordon Brown, Peter Hitchens, Paul Mackney, Marianne Faithful, and Greg Dyke. 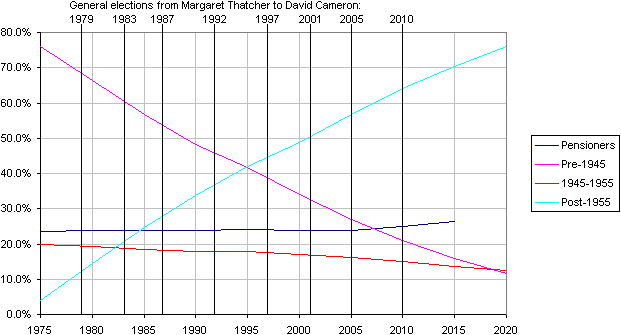 Perhaps this is why the author defines the baby boom as he does: Tony Blair, Gordon Brown, Peter Hitchens were all born after 1950, between the two booms, and so were not in the real post-war birth-spike. The lives of these particular people are not representative of the people born during the post-war years! Yet he still claims to speak for the rest of us: “At some level we baby boomers know we have squandered the inheritance our parents worked so hard to give us”. No we didn’t! (I was born in 1947). But perhaps the author did. Some of the author’s criticisms are off the wall: “And the penalties for truanting are growing …. one of the arguments used in favour of school uniforms is that they help the police recognise those who ought to be at school. We are forcing our children into prison uniform so they will be instantly recognisable when they scale their prison walls”. Is it really so bad that children should be persuaded to make the most of their one chance for school education? He appears unaware of how lots of other people in his 1945-1955 cohort lived.”Many of the baby boomers grew up in Bevan’s council estates. If they had been born … a generation later, in terrifying tower blocks”. I lived with my parents in a concrete block of council flats through school and university. And where he says “my grant gave me enough to live on and I did not have to work in term time, or beg from older relatives”, my parents delayed buying their own house and my mother went to work to help me through university, and I had 3 jobs over the 3 years. He does not speak for me. Much of the book describes how various features of society arose; who the players were. This is valuable for making a point that the author appears unwilling to accept: there were very few players, and they were active within politics. “Normal citizens” had relatively little power or influence, even in large numbers. Only a fraction of a percent of any cohort gets their hands near the levers of power. The rest of us struggle with our lives in a country where things happen that we don’t full understand and have virtually no control over. Many things that happened were caused by international forces (especially the USA) or chance. Those under UK control were caused mostly by politicians, not “baby boomers”. (He points out that Blair went to war in Iraq against the wishes of his own people. I never voted for Blair, in fact I pretty well had contempt for what he and Brown did, and I am not responsible for what they did). “Baby boomers” are just people to blame for things other people don’t like. But most of the history he presents really has nothing to do with the subject and subtitle of this book: “Why the Children of the Sixties … Failed the Future”. It appears to be just an excuse to write an autobiography in the context of political history! (I really didn’t want to know what plays he had seen in theaters or what songs he remembers). He adds notes about baby boomers almost as an afterthought. For example: “While the baby boomers were demanding new freedoms, Wilson was providing them. There was the Abortion Act ….” Reminder: the Abortion Act was 1967, when the voting age was still 21. So only people born in 1946 and earlier were in the electorate at the time! Not a significant part of the 1945-1955 cohort, and less than 3% of the electorate. So how did we “demand”? Correlation is not causation! (It was 1973 before all of his cohort could vote. Which makes chapter 8 of the book rather strange: its title is “How the baby boomers destroyed the trade unions and made Thatcherism: 1969-79″). One trick he plays is to quote other people talking about baby boomers without pointing out that they are talking about a different group. When he quotes the think tank Demos saying “Future generations will have to do a deal with the baby boomer generation”, they were talking about the 1945-1965 20-year cohort, (as they normally do), not the author’s fairly insignificant 10-year cohort. And perhaps Demos also forgot that any baby boom cohort is relentlessly becoming a smaller fish in a bigger pool year by year. Elsewhere he switches to talking about “… the fifty-plus group …”; that is vastly larger than his baby boom cohort! People talking about baby boomers have a dilemma. If they include all the periods of high births rates between 1945 and 1975, few generalisations can be made. At any date, for example a general election, the youngest and oldest of them are at different life stages, and have contradictory attitudes and influences. If they talk about a narrow range of birth dates, as this author does, the total population within that range is too small to have had a big influence on the nation. It is simply unsound to write books about “baby boomers”! This book doesn’t credibly describe the people born from 1945 to 1955, nor adequately describe their real influence on the world. And it doesn’t offer any remedies for current ills or lessons for the future. Why are people born 1945-1965 called baby boomers?